Button, antiqued copper-finished "pewter" (zinc-based alloy), 17mm single-sided wavy flat round with textured square design. Sold per pkg of 20. Item Number: H20-A4111FN Have a question about this item? 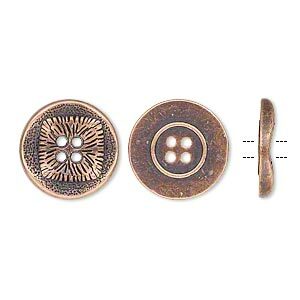 Traditionally used for sewing, buttons are also functional jewelry-making components and can be used as links, charms, clasps, embellishments and more. Button holes are great for stringing or attaching to designs with headpins, wire, adhesives or a variety of other options. Each button has four holes. Colors, shapes and sizes may vary in each lot. Button, antiqued copper-finished "pewter" (zinc-based alloy), 21mm single-sided wavy flat round with textured square design. Sold per pkg of 20. Button, antiqued copper-finished "pewter" (zinc-based alloy), 15mm single-sided wavy flat round with textured square design. Sold per pkg of 20. Button, antiqued brass-finished "pewter" (zinc-based alloy), 17mm single-sided wavy flat round with textured square design. Sold per pkg of 20. Button, gunmetal-finished "pewter" (zinc-based alloy), 17mm single-sided wavy flat round with textured square design. Sold per pkg of 20. Button, antiqued silver-finished "pewter" (zinc-based alloy), 17mm single-sided wavy flat round with textured square design. Sold per pkg of 20. Button, antiqued brass-finished "pewter" (zinc-based alloy), 15mm single-sided wavy flat round with textured square design. Sold per pkg of 20. Button, antiqued silver-finished "pewter" (zinc-based alloy), 15mm single-sided wavy flat round with textured square design. Sold per pkg of 20. Button, antiqued silver-finished "pewter" (zinc-based alloy), 21mm single-sided wavy flat round with textured square design. Sold per pkg of 20. Button, antiqued brass-finished "pewter" (zinc-based alloy), 21mm single-sided wavy flat round with textured square design. Sold per pkg of 20. Button, gunmetal-finished "pewter" (zinc-based alloy), 15mm single-sided wavy flat round with textured square design. Sold per pkg of 20.